As the name suggests, hot Hungarian paprika (erős) is the spiciest and hottest of the eight types available. Sweet, savoury and mild varieties, with other subtle variations in between, are also fabulous for adding flavour to your home cooking. 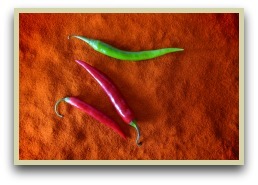 As a big chili pepper fan, I prefer the hotter types, but all varieties have their place in your cooking. Today this spice defines Hungarian cuisine, and is celebrated as a symbol of Hungary and a national treasure. There is even a Paprika Museum in the town of Kaloscsa, which hosts a festival every October. It was brought into the country by the Turks in the 16th century, and originally used just as a decorative plant. But it wasn't long before they began drying it and using it to spice up their meals. The regions of Kalocsa and Szeged in southern Hungary produce the most, since they have the plentiful sunshine that pepper plants enjoy. 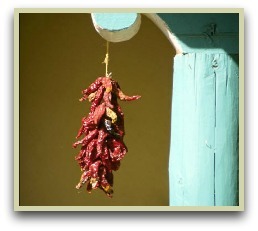 In September, when the ripe fruits are harvested, the towns are all decorated with bright pepper garlands which are hung across fences and front porches. This was once done to let the peppers rest before drying them out in earthenware ovens. Then, the dried pods were crushed into a fine powder using a mortar and pestle. Today, the powder is made commercially, but you can still get some made in the traditional manner. The peppers are also available fresh or as a paste. When you are cooking with this spice, you could use the Hungarian traditional method of adding it to hot oil to cook your onions. Heat it gently, stir it constantly, and use it to make soups, many potato dishes, various stews or a traditional goulash, and enjoy! Click for my potato recipe. Available as a digital book that you can download and start using right now. Click to read more. Info on the Pepper - Hot, sweet, mild or smoked. What's your favourite?